The 2008 PFC Energy rankings’ headline is that National Oil Companies (NOCs) have completely replaced International Oil Companies (IOCs) at the head of the list but another story, like a glimmer of a future reality, is emerging at the edge of that: The Spanish wind and solar giant Iberdrola Renovables became the first New Energy company ranked among the top 50 and First Solar, a solar energy company leading the way in thin film materials, grew more in stock value than any other energy company. ANY other energy company, be it oil, gas, coal, biofuels, whatever. First Solar’s stock value went up 795%. That’s not a typo: Seven hundred and ninety-five percent. 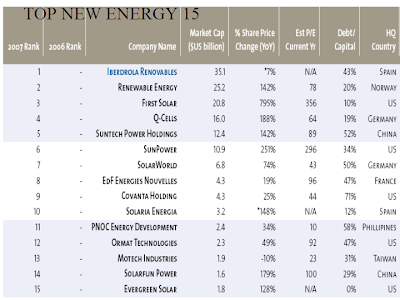 It is also significant that PFC Energy for the first time created an Alternative Energy Top 15. Perhaps in another half century the Top 50 will be companies now developing New Energy and there will be an Old Energy 15, representing the dinosaurs from the fossil fuels era of the 20th Century. IOCs replaced NOCs as the top-ranked oil and gas powers on PFC Energy’s Top 50 but, perhaps more importantly, Iberdrola Renovables – a New Energy company – ranked #36 in the Top 50 and First Solar’s stock grew more in value than any other energy company in the world. - The 50 are chosen based on 2007 share price increases in companies' domestic markets and currencies. - First Solar’s stock jumped 795% in value during 2007. - 2005: Top 6 were IOCs (ExxonMobil, BP, Royal Dutch Shell, Total, Chevron, Eni). 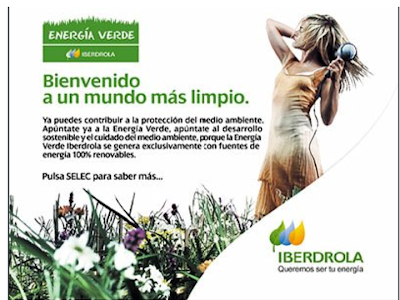 - Iberdrola Renovables is based in Madrid, Spain. - First Solar is based in Phoenix, AZ. - While the IOCs represent ExxonMobil, BP, Royal Dutch Shell, Total, Chevron and Eni represent Europe and the U.S., the NOCs represent Asia and Latin America. - Iberdrola is currently active in wind, solar, hydro, biomass and wave/tide/current energies. It has a portfolio of 7,700+ megawatts of capacity. 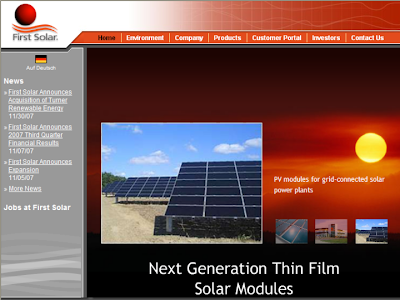 - First Solar’s website features the slogan “Next Generation Thin Film Solar Modules.” It specializes in the Cadmium Telluride (CdTe) thin film formula. - The shift in the top 6 reflects a profound change in who has access to oil resources today. 65% of oil is controlled by NOCs and off limits to the IOCs. - 2007: Petrochina replaced ExxonMobil as #1; Sinopec rose from #12 to #5; Petrobras went from #11 to #6. - 2007: First Solar stock rose 795%; NOCs rose an average 73%; IOCs rose 20%.